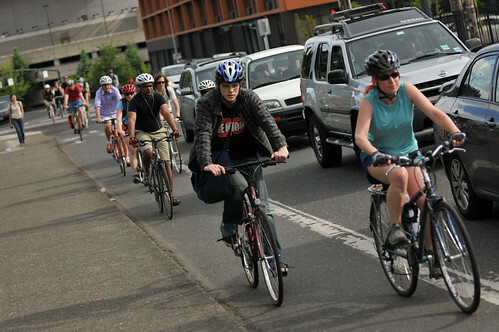 People squeeze into the bike lane during evening rush-hour on Williams. Yesterday was the first day of summer and arguably the nicest weather Portland has had all year. 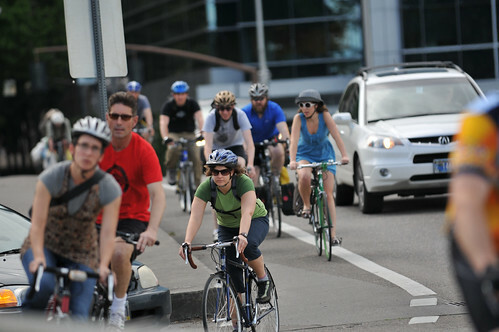 With that in mind, I spent some time on the Hawthorne Bridge and on N. Williams Avenue — two of Portland’s busiest bikeways — to see how traffic was shaping up during the evening rush hour. If you’ve got a suggestion of a place I should photograph, please drop me a line. I don’t know if I’d call the Hawthorne Bridge “stressful”, but you (“you” meaning ALL of us) have to keep your eyes open. I do tend to breathe a sigh of relief when I make it past the bridge and into Ladd’s Addition. But then I have to watch out for those sneaky cops! If everyone remembers that in dense traffic conditions you need to slow down, then I don’t find Hawthorne stressful. If people think that because they’re on a bike they should be able to go as fast as they’re physically able, no matter the conditions, then I find Hawthorne stressful. i do not understood why some cyclists are so “concerned” with the way others ride. safety is the salient issue, *not* speed. I use the word stressful in this case to describe what the combination of hazards and noise that are present on the Hawthorne. I personally find it stressful when I go slow to be holding up a lot of people behind me. I find it stressful to have huge trimet buses blow by within a few feet of my elbow. I find it stressful to have people on bikes zoom by me.. i find it stressful to dodge runners with headphones, tourists walking 4 abreast, and so on. People in cars and in transit have to deal with none of those things… Of course they also don’t get the breezes and views and sheer delight of riding, which is stress-reducing… so maybe it all balanced out? ;-). And just for the record, I don’t want to overstate the “Stress” part of this story. It was just a feeling I wanted to share. I read you loud and clear regarding the “tourists walking 4 abreast” only I’m not so sure that they’re tourists, and that makes them a tad bit more annoying. Its not that bad. Non-riders, please get on your bikes and congest these routes to make it really bad so that we can get some changes! 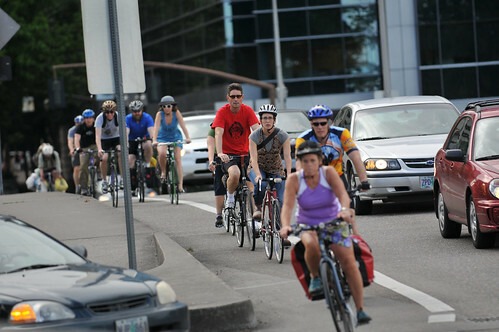 The most dangerous part of crossing the Hawthorne Bridge is the other cyclists. as a true racer boy, I agree whole-heartedly with you. peeps need to mellow on the bridge. do you have any evidence…or is this just emotion. I dislike cyclists attempting to pass me at the same time I’m passing pedestrians. One of them will eventually end up going off the curb onto the bridge decking, and it won’t be my fault. i don’t like this either but in my experience its hardly the rule. spare_wheel, I doubt this will satisfy your criteria for “evidence” but I have witnessed crashes on the Hawthorne Bridge as a result of excess speed. EVEN IF I HADN’T witnessed these (3) crashes,the “evidence” is right here in these comments. If people do not FEEL comfortable (regardless of whether the environment is statistically safe) that alone is a problem. Perceived danger hurts ridership. I subscribe to the “Safety in Numbers” theory. Perhaps you do not. Either way, I’ll thank you to slow the heck down next time you pass me and, for instance, my visiting-from-out-of-town Mom. Whether your speed is “safe” or not in your eyes doesn’t matter. HER perception of your action as “dangerous” might mean that she won’t be willing to ride a bike with me next time she visits. If she was alone in this type of reaction, I’d tell her to buck up and get used to it. Judging from the comments, here, though, I don’t think she’s alone. nice rant but i make every effort to pass at safe speeds on the hawthorne bridge. i approach, say “left”, and if they move aside, pass at ~10 mph. yet some are *still* discomfited. world class bike cities have slow riders and fast riders. if you are slow you need to get comfortable with being passed because its going to happen, alot. unfortunately there are also some who believe that all cyclists should “STFD” and “enjoy the scenery”. three words: EAT MY DUST. Sounds like I misunderstood. “Eat my 10 mph dust?” Carry on, speedracer. Your words, not mine, speed grouch. I slow down on a narrow mup, but on the open road I ENJOY passing other riders, motorists, and even trimet buses. 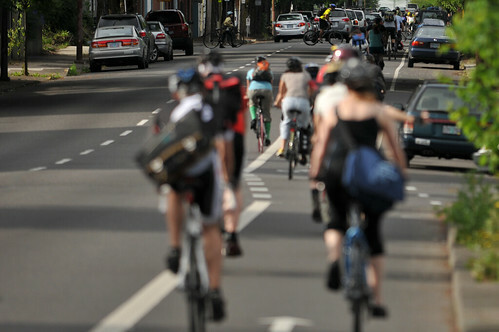 The Williams Ave. photos are particularly striking–especially the one that shows about 10 people on bikes occupying a very narrow bike lane, flanked by about 7 people in cars occupying two very wide car lanes. Something, as they say, has gotta give. For sure. (And I think the discrepancy is only going to grow as more people on bikes/foot use Williams to get home and get around.) Perhaps they should start counting cars based on occupancy–if you’re a single person occupying a four-seater automobile, you count as .25 of a commuter, to offset the pollution produced, space wasted and danger posed to other commuters. Imagine if every person biking rode one of those tourist pedal-cars–empty save for them–down the bike lanes. The sheer amount of space that cars inefficiently take up is a problem all on its own. I’d love to Photoshop that first image of Williams to get rid of the cars but leave their drivers hovering above the road, showing the imbalance of space allocated to the few SOV users and the people on bikes crammed into the bike lanes. Spencer. Do the same thing with the cyclists. Show all participants hovering in midair. It will be extra poignant to show one group of people relegated to a narrow band of the asphalt and overcrowded while a few are spread out hogging the rest of it. John, that sounds much more difficult :). But yeah, that would be the best comparison. This was the one I meant BTW: http://farm4.static.flickr.com/3083/5859196410_04886c79fe.jpg. I described it as the first image of Williams, but that was incorrect. I definitely like the idea of more space for bikes. But a real, fair view of the traffic would take into account that cars (generally) travel faster than bikes, so a still image wouldn’t capture the several cars going by. Also, a still image doesn’t capture the seasonal change. 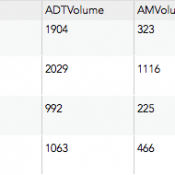 How would the traffic balance look on a cold rainy day mid-January? A photoshopped image would be nice propaganda, but not really the truth. Two stressful parts of my ride the last two days. The first was a Trimet bus driver “taking” the bike lane forcefully at the first stop after the Weidler and Williams intersection. I was far enough back with a sufficient traffic gap (and a confident and quick enough rider) to take the left lane (the bus driver pulled diaganolly to the stop effectively blocking the bike lane and the left lane) and get around the bus, but others ahead of me had to stop quickly. I though Trimet had a bike lane yield policy? I don’t know what the driver was thinking. Then yesterday, I flinched as not one, but two folks on bikes cut the Weidler red light / red crosswalk indicator at the Weidler and Williams intersection as the bus was starting up Williams. The bus had the green for a few seconds and I thought they were pancaked. 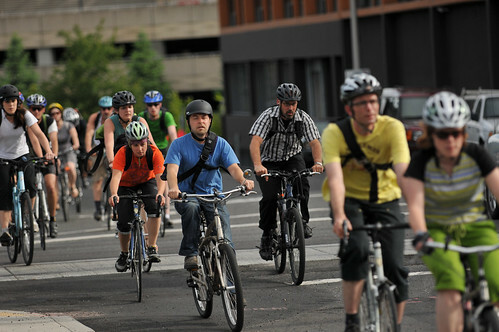 One person was riding a bike with gear that hinted that they were more likely someone who commutes most of the year. I don’t know what the riders were thinking. I have to agree with Nick V. and el timito. Personally, I feel extremely grateful for what we have here in Portland. We do need more bride crossings, but I’ll take a congested Hawthorne any day of the week. Remember that it is an URBAN bridge and very old. Buses, vibration, noise, people, these are all part of the package and always will be. Absolutely it can be stressful, but also a great luxury. I’m not sure if you drive at all Jonathan but driving in Portland stresses me out all the time. And riding tri-met is by no means a tranquil experience. As for N. Williams a solution will reveal itself over time. Hopefully sooner than later. I ride that lane 2-5 days a week and my only real problem is with dangerous cyclists who want to push the limits of the lane and safety. Yesterday was opening day of idiot season, so get ready for some bike lane fun. Just like when I drive, it’s the minority of drivers creating dangerous situations for everybody. I don’t think my nuance is being understood. But that’s fine. I hear you Crash N. Burns. And yes, I absolutely do drive (and with a mini-van full of kids no less) and I do know that driving around town is also stressful. I didn’t mean to say that driving lacks stress… just that it’s a different kind of stress. OK. Back to bike traffic. if they are not endangering you or others, then what’s it to you? imo, this school marmish disapproval is often projection mixed with more than a little envy. Bikes everywhere – I’m loving it! WIlliams is in definite need of some changes to accommodate the amount of bike, bus, and car traffic. Or else we need a new bridge from North Portland into downtown. Also, the foot traffic on bridges needs to be regulated. Pedestrians crossing a bridge need to do so on the correct side, moving with bike and car traffic, and stay to the right. Always. The Broadway Bridge heading westbound into downtown would be a great place for photos. Tons of traffic and they just repainted the 4 1/2 foot bike lane. The one thing I enjoyed about the streetcar construction was having a full protected bike lane there. I’m busy enough at work that I don’t leave the office (SW 6th and Alder area) until 5:30 p.m. or later, and I’ve never seen bike traffic that congested on the Hawthorne. I suspect that if things get really bad, people will start to time their departure to avoid the 5 p.m. rush … a self-adjusting system! I will say that Williams looks packed; I’m happy to do the bulk of my commuting on Lincoln. I’m staying off of Williams until the rain comes back. Amatuer hour out there when the sun is shining — too many fair weather cyclists who don’t know how to ride a bike. And that makes it dangerous. I ride Williams every day and have found that it is not the “fair weather” riders that make it dangerous but all the annoyed “all season” riders who make the ride dangerous. People are hell bent on getting around those they perceive to be inexperienced or too slow and will risk cutting things too close both for themselves and for those around them. It is discouraging to me that we criticize the new riders for not being good enough to share our bike lanes but then we give them horrible examples of how to behave as a seasoned commuter. I also ride Williams every day. And, I will admit that I get frustrated with the people that are riding primarily only in nice weather and sometimes ride like a jerk. I do try to control myself, though, and cut some slack just being grateful that people are out enjoying themselves. I do wish that people would not ride two abreast in the Williams bike lane. I know it’s allowed, but that is one of the narrowest bike lanes around, and there’s a ton of bike traffic and (too fast) car traffic. Two abreast makes it very very difficult to pass safely. And when I said “ride like a jerk,” I meant that I ride like a jerk out of frustration. I’ll admit it. I’m trying more not to. Great photos Jonathan. It’s so inspiring to see so many people out biking. Can’t wait to see what our bike counts will look like this year. 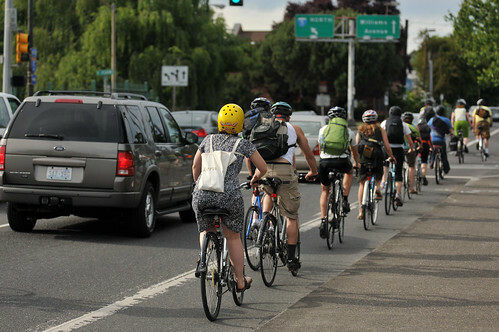 I’m struck by how much worse the commute would be for everybody if all of those people on bikes were in cars. A coworker of mine has proposed a demonstration called “drive your bike to work day” to demonstrate how much auto traffic is eliminated by people riding their bike. I’m struck by the difference in style between Portland bike commuters and Copenhagen bike commuters. Finally, in the second photo of the Williams set (I think this is where Williams crosses Weidler? ), I love the way a bunch (herd?) of bikes can look like a chaotic mob. Thanks for the reminder of how many people are commuting by bike. It has been suggested (last summer?) that pedestrians should be directed to the opposite “sidewalk” (south side am, north side pm). There doesn’t seem to be consensus on which portion of the “sidewalk” to ride on. I interpret the illustrations to mean bikes to be ridden on the left side, but many people ride in the middle or weave in and out of groups of pedestrians on the right side. I ride as close to the left edge as I dare allowing speedsters to skoot by on my right when the opportunity presents itself (but I know that this is anathema to those conditioned to always pass on the left). Rodney is a mellow neighborhood street one block east of Williams – sure it has stop signs, but there are no traffic lights. Yeah, I prefer to pass on the left because I assume that’s what people expect. 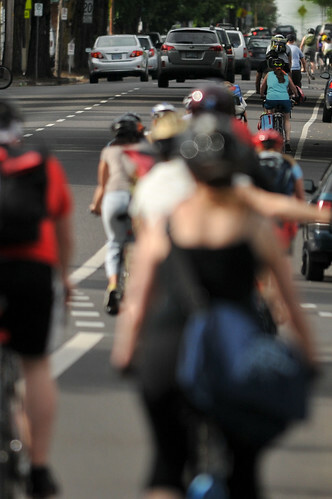 I will usually hit my bell if I’m trying to pass someone who’s riding in the middle, and I expect them to move to their right, leaving the left for passing. If you move to the left, I’ll probably pass on the right, but will mentally shake my fist at you for Fredly behavior. I love it when the racer boys try to rationalize and justify their rude behavior. My issues with the Hawthorne bridge are usually with fair weather runners going the opposite way in the bike lane and not moving over. It is so much easier for runners to move over but for some reason not all of them do. Secondly, everybody’s sense of a safe passing speed is going to vary. Personally anything below 10mph is dangerous. You are less stable and unpredictable at low speeds. You need to keep your line, and signal when you are moving across. On days when I’m just cruising, i’ll take the right side on the bridge so that I don’t slow down bike traffic and then proceed to pass them on the uphill after the bridge:) I also take it really slow coming down Hawthorne after the bridge because there’s just a lot to contend with even with the wider lanes; doors from parked cars, cars on the left, cyclists trying to pass, cars pulling out, etc. 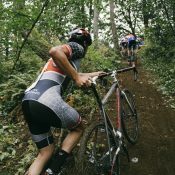 These comments made me think about my daily ride, and what I find most (and least!) stressful about it. I think Nick V, Allan, Crash N. Burns, and others make some good points. My best rides are when everyone — on bikes or in cars/buses, including me — is friendly, aware, and responsive. My worst rides are when people — including me — are unfriendly, oblivious, and defensive. My ride is stressful when I think of others as obstacles; it isn’t when I think of others as actual people (and when I feel like they think the same about me). 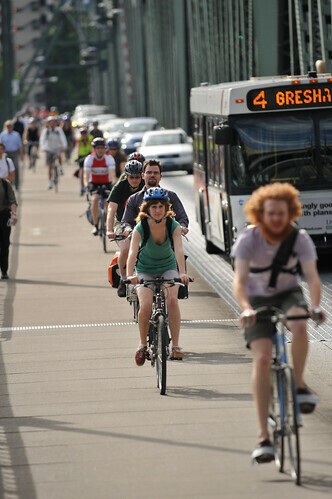 As a year-round bike commuter (and one of the people in the Williams photos), I know that my trip up Weidler from the Broadway Bridge to the I-5 ramp on Williams can be intense, and filled with buses, cars, bikes, pedestrians, and people who keep standing in the Weidler/Williams jughandle. Until Williams gets the updates it needs to create a safer space for all, just being aware of my surroundings goes a long way towards a safer, more enjoyable (if a bit slower) ride. And while the influx of summer cyclists can be annoying after a winter of open lanes, I’m glad those people are on bikes on the road, increasing our visibility, and making the case for better bike infrastructure. exactly! 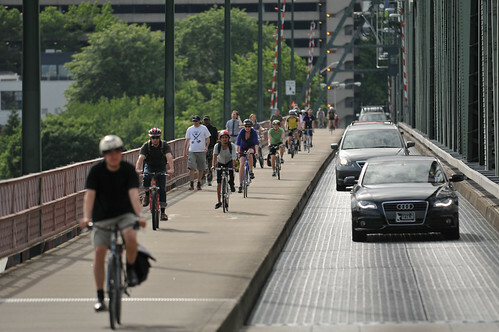 what percentage of the total traffic on the Hawthorne Bridge needs to be cyclists before they give cyclists their own lane? It’s already over 25%…. 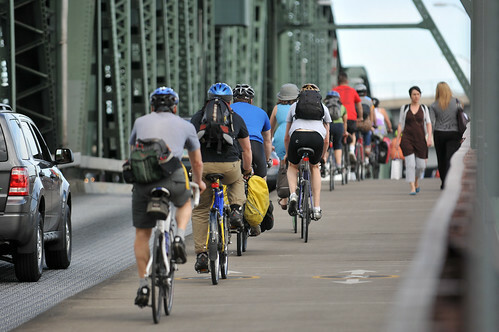 Is it true that 25% of Hawthorne Bridge traffic is by bike? 20% in 2010, counts not done yet this year. if they are not endangering you or others, then what’s it to you? ironic how you mention unsafe riding when i specifically stated…and i repeat: “if they are not endangering you or others”. cognitive dissonance. Great photos and good discussion going on. Maybe it’s a good time to dust these PSA’s off and remind folks that rider behavior can make a huge difference on how stressful a bike commute is. I think rush hour is an awful time to try to pass anyone on the Hawthorne bridge. Sit back and enjoy the ride! I for one love a crowd! Plus, statistically (read this somewhere authoritative) it dramatically reduces the probability that you will be hit by a car. I think its fun fun to look at other bikes and the people who ride them. If you are super-concerned with time efficient commuting you would probably still take a car/transit anyway right? Chill & cooperate. and you ignored the lawless part of my post…what’s your point? Just an outsider’s perspective but WOW, what a great scene to have so many bikes on the street – and not on bike-to-work-day! Jonathan, you asked us to drop you a line about places to photograph – how about Missoula, Montana?? Thanks for the great pics — looks like $4 gas and better infrastructure is creating another year of bicycle traffic growth. 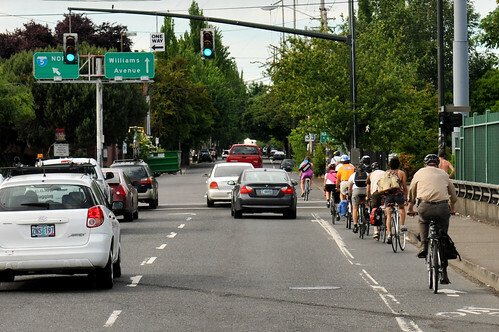 The photos show just how much we need a second bike lane on Williams. It’s nuts trying to cram a huge bunch of commuters with a range of preferred operating speeds into a single lane. Cheers Dan. This is precisely why I largely take the summers off from biking and walk significantly more. As soon as the temp drops and the clouds roll in, I’ll be back to my much more spacious commute.